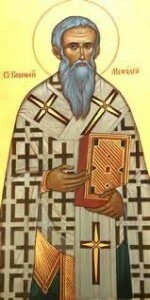 St Methodius was a monk originally from Sicily who became the patriarch of Constantinople. He encouraged the restoring the veneration of icons after the iconclastic controversies and he also established what came to be known as the feast of Orthodoxy (i.e. right faith, that is, the legitimacy of icons) in the Eastern Church. The image shows Methodius to the right of the icon of the Mother of God with the Empress Theodora and her son Michael to the left. Patrick Duffy tells the story of St Methodius and Iconoclasm. The movement of iconoclasm (or the “breaking of images”) was influenced by three factors: Islamic and Jewish prohibitions on making images of God, the Gnostic belief that matter was evil and the monophysite ( “only one nature”) denial of the real humanity of Jesus. The opposite of an iconoclast is an icono-dule (that is, servant or slave of images) or, more positively, icono-phile (lover of images). During the 8th and 9th centuries many of the emperors at Constantinople espoused iconoclasm, mostly because of the general opposition to the use of images and relics, and also because the use of images was an obstacle to the conversion of Jews and Muslims to Christianity. Additional dimensions of iconoclasm, apart from persecuting and imprisoning iconophiles, are the disrespecting of relics and the refusal to ask for the intercession of the saints. What sparked the controversy was the decision of the emperor Justinian II (685 to 695 and 705 to 711) to put a full-face image of Jesus on the obverse of his gold coins. This prompted the Caliph Abd al-Malik to cease using images, but only lettering, on his coins. The Emperor Leo III the Isaurian (717-741), who may have had leanings towards Islam, ordered the removal of the image of Jesus from over the ceremonial entrance of the gate to the Great Palace and its replacement by a cross. So began the war between iconodules or iconophiles and iconophobes. Most emperors for the next hundred years (with the exception of the regents Irene and Theodora) were iconophobes favoured iconclasm at Constantinople. Some even tried to get the popes to introduce it in Rome. Methodius had been born in Syracuse, Sicily, and became a monk on the Greek island of Chios, from where Patriarch Nicephorus I (806-815) called him to Constantinople as his assistant. But Patriarch Nicephorus was soon deposed by Emperor Leo V the Armenian (813-820) and exiled to a distant monastery from where he carried on a literary polemic against iconclasm. 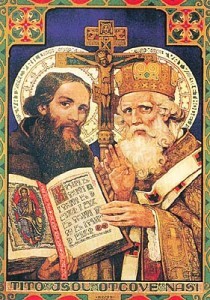 Methodius went to Rome with a letter informing the Pope of the situation and stayed there until 820. He returned with a letter requesting that Nicephorus be reinstated. But he was thrown into prison himself for about nine years. Under the emperor Michael II, Methodius was beaten up for his activities and kept in confinement. He was released in 829 and held a position at court until in 843 when the Empress Theodora, widow of the Emperor Theophilus and regent for her son Michael III, reversed imperial policy and appointed Methodius patriarch in place of iconoclast patriarch John Grammaticus. A compromise was worked out by the influential minister Theokistos to restore the veneration of icons: the deceased husband of the Empress, Theophilus, would not be condemned; Methodius made the symbolic procession into the Hagia Sophia cathedral accompanied by Theodora and minister Theokistos on March 11, 843. This then became the feast of Orthodoxy, now celebrated each year in all Byzantine Rite Churches on the first Sunday of Lent. It celebrates not just the restoration of the icons, but also affirms the doctrines and people the Orthodox Church approves, and notes the heresies it declares anathema. Throughout the final four years of his life as patriarch (843-847), Methodius did not pursue former iconoclasts but even strove to reign in the extremists who wanted all former iconoclasts severely punished as heretics.